3LAB's Guide to Luxury Living: CBS 7 Helps Guys (and Gals) Get Ready for Valentine's Day! CBS 7 Helps Guys (and Gals) Get Ready for Valentine's Day! 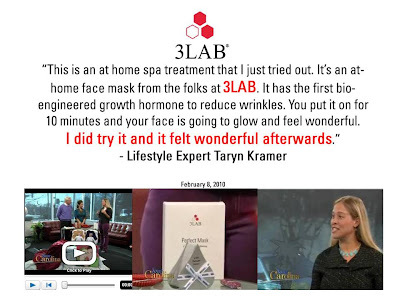 Thank you to Jack, Kimberley and Taryn for featuring 3LAB on their show and reminding guys what girl’s really want for Valentine’s Day: 3LAB Perfect Mask for a spa-like treatment at home! The Perfect Mask ($120 for six treatments) is a skin purifying, non-woven, 100% cotton sheet mask that lifts and brightens the skin- even after just one use! The mask itself is infused with Nano Claire GY™, Green Tea and other powerful antioxidants that effectively reverse the aging process while Ginko Biloba helps to improve blood circulation. And girls: if the guys don’t take the hint, treat yourself!